Please join us for the second Recovery Reinvented, a day focused on advocacy, getting and implementing community resources, and eliminating the shame and stigma of addiction. Gov. 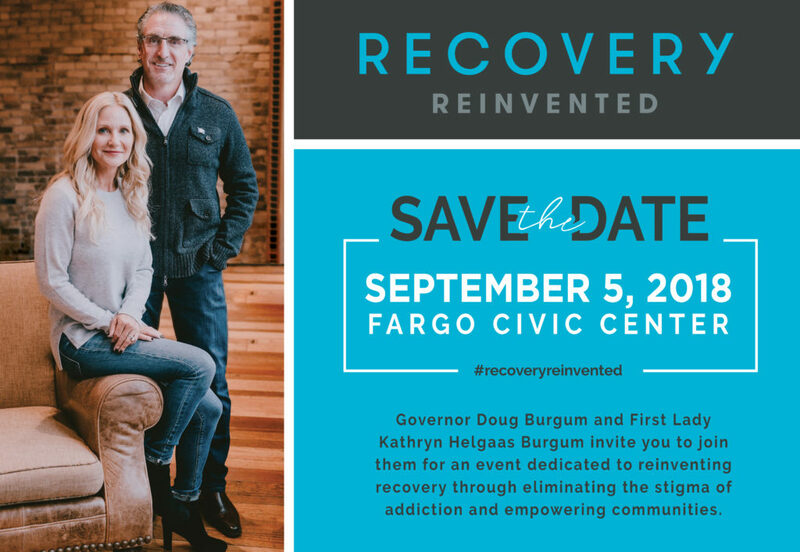 Doug Burgum and First Lady Kathryn Helgaas Burgum are inviting the general public, American Indian communities, business and community leaders, behavioral health providers, university and college representatives, health care providers and administrators, addiction recovery advocates, faith-based communities, first responders, law enforcement, families and more to join them for Recovery Reinvented on Sept. 5 at the Fargo Civic Center. The daylong event will feature state and national addiction and recovery experts who will focus on reinventing recovery through advocacy, community resources implementation and the elimination of stigma of the chronic brain disease of addiction. The governor and first lady recognize that alcohol and drug use is still the No. 1 social problem in North Dakota with ramifications for the workplace, schools, communities and families. More details will be coming soon at recoveryreinvented.com, on Facebook at @GovernorDougBurgum and @flkathrynhelgaasburgum and on Twitter at @DougBurgum and @FirstLadyND.